The file management operations refers to the manipulation of GPC files and GPJ project files. The operations goes from the creation of a new files, up to how to save, open, and close files. To create a new file, go to File->New->GPC Script menu (Ctrl+M) or just press the correspondent icon in the toolbar. A base script will be created and a new compiler tab will appear with the title "New". The option Empty File (Ctrl+N), as the name implies, just create a blank file. The menu File->New also contain templates of simple scripts to illustrates some basic structures of GPC programming language. GPC files placed in the subdirectory "gpcnew" of the working directory are also listed in this sub-menu. This feature allow the user create and maintain custom GPC file to be used as default files. Opening goes very similar to any other windows application. To open a GPC or GPJ file, simply go to File->Open, click on the open icon in the toolbar or use the shortcut key Ctrl+O. A dialog will appear and you can select one or multiple files to open. Each file will be opened in an individual compiler tab, if a file was already opened, its correspondent compiler tab will get focus. You can also open GPC and GPJ files by double clicking on their icons, for that you need to associate these files with Gtuner software in Gtuner Options. Saving a GPC file can be done in multiple ways. The default way is to select File->Save on menu (Ctrl+S), or clicking on the save icon in the toolbar. If it is an existing file it will be overwritten with the current contents. If you want to save all the GPC files you have opened at once, you can select File->Save All in the menu, or on its icon in the toolbar. If the file has yet no name (for example, if you had created a new GPC file), or you selected File->Save As, the save file dialog will pop up, asking you for the name of the GPC file. You can then choose the location and the name of the file. To indicate that a GPC file was changed and has not yet been saved, an asterisk (*) will be displayed in its tab bar, after the filename. To quick close Gtuner Pro and yet save all opened documents the keyboard shortcut Ctrl+Shift+S can be used (Save All and Exit). 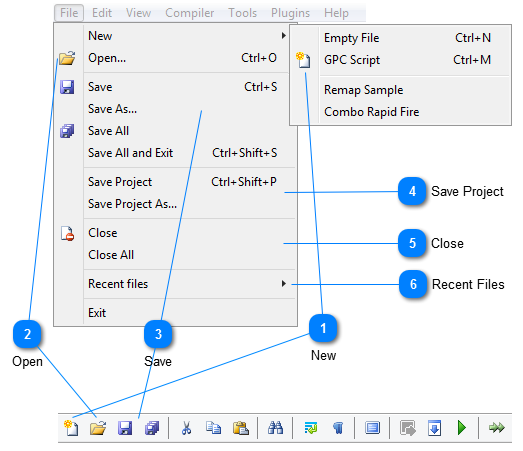 The references to all opened GPC scripts can be saved into a project file (GPJ). A project file is a easy way to recall the currentely opened GPC files (session), such that, opening a project file is the same than open all script files belonging to the project one by one. In order to close the GPC files you have open, you have multiple options at hand. Remember that if you have any unsaved data in a GPC file, Gtuner will always ask you if you'd like to save those changes before closing any file. Primarily, you can close any file by selecting File->Close. To close all files, select File->Close All. Finally, you can close any active tab by clicking on the cross in the right corner of the script tab. The Gtuner keeps a list of the 10 most recently opened files in the File->Recent files menu, so you can reopen them quickly by simply click on the file name.